Indian Ultrasound Equipment’s market volume reached 2,096 units in CY Q4 2013. GE Healthcare emerged as the market leader. 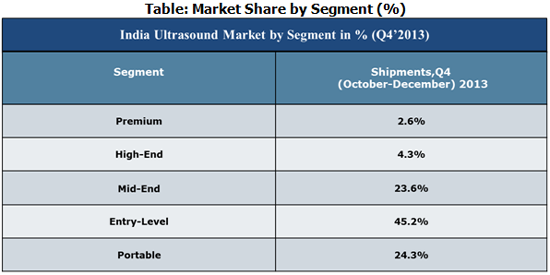 Source: 6Wresearch Quarterly India Ultrasound Market, CY Q4 2013. During CY Q4 2013, in the display segment, LCD (Liquid-crystal display) captured more than 79% share of the total Ultrasound Equipment market. Further, 15 Inch monitor registered around 32% of the total market share.